Last year I mentioned to the OH briefly about making a donation at Christmas a regular thing, we would pick a charity each year and donate in some way, be it financially or donating items such as clothing, food etc. We thought no more about it until yesterday when we had both decided to do it without remembering last years conversation and telling each other last night. The OH has donated to the Mercy Hospital Fundraising Cancer Appeal in Cork this year and signed up for monthly donations. This is an issue close to his heart and he felt it appropriate to have this as his charity for 2015. The fundraising from this appeal is to help support the hospital in delivering the highest quality of care to its patients as well as supporting advancements and innovations for the care and treatments of it's patients. He signed up for this with a fundraiser who called to the house but you can find out more info by clicking on the link above. 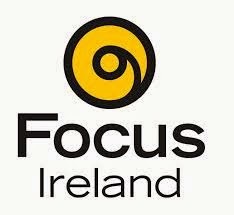 I have chosen Focus Ireland to make a donation to this year. My drive to work recently has been filled with headlines on the radio of how the number of homeless people on the streets of Cork and nationwide have increased and I think the tragic news of Jonathan Corrie, a homeless man found dead in a doorway in Dublin this week has driven it home for me. Cork Simon Community have said that the number of people sleeping on streets of Cork have risen by 500% in the last 3 years. I find this statistic astonishing and it's made me determined to do what I can to help the situation, be it big or small, all of these donations together make a difference. For more information please click on the link above. And lastly while I was discussing this with my work colleague, she suggested doing something in the office too. We have 420 students between our 2 sites and decided that the St Vincent De Paul Food Appeal would be a great idea., donating food to families who will find it a struggle to feed their loved ones this festive season. We are asking our students to donate items from a shopping list provided by SVP and leave them in Reception up until December 22nd when we will arrange for someone form our local SVP office to collect the items. Please click on the above for more information about the 2014 Food Appeal. We spend most of December running around trying to find the perfect Christmas gifts for our loved ones and it's easy to forget that there are people out there struggling, be it financially, fighting an illness or just getting through each day at a time with whatever resources they can find at the time. While these kind of donations are required all year long, I think Christmas is a good place to start. Do you donate or volunteer with any organisations? I'd love to hear your stories. Such a fabulous idea... I have heard of a few people doing this! It's what the heart of Christmas is all about anyway I suppose! Thanks so much for linking up to #SavouringtheSeason... Sorry I'm late!